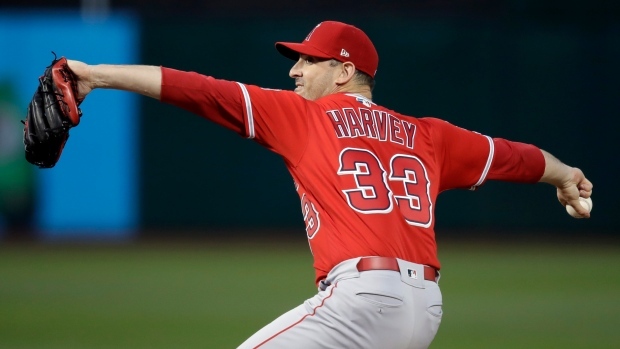 OAKLAND, Calif. — Matt Harvey was one hanging curveball away from looking start-to-finish like the ace he had been with the New York Mets. Khris Davis belted that misfired breaking ball into the left field seats, but a big hit from Andrelton Simmons ensured Harvey's first start with the Angels was an enjoyable one. "He was really, really good," Ausmus said of Harvey. "He used all of his pitches, his velocity was up in the mid-90s, he threw some really good curveballs. I liked the fire that he showed." Mike Trout doubled in two runs, Kole Calhoun had an RBI single and Justin Bour drew a bases-loaded walk to spark an Angels offence that failed to score over the first 16 innings of the season. "We won this game against that kind of offence because he kept them off the board," said catcher Jonathan Lucroy, who signed with the Angels this off-season. "I was in that lineup last year, I know how good that lineup is. Him only giving up two runs to them, that's pretty impressive." "That was the big point of the game for me," Harvey said. "To get through that with no runs ... that's what I remember from when I was good." Davis homered for the second straight day, but the A's normally reliable bullpen didn't hold the lead. Davis, who led the majors with 48 home runs in 2018, has three in four games. Lucroy and Brian Goodwin singled off reliever Joakim Soria (0-1). After Calhoun doubled in Lucroy, Trout was intentionally walked to load the bases. Ryan Buchter replaced Soria and walked Bour to force in a run. Simmons, who was hitless in the opener Thursday, followed with a sharp single to right-centre off Liam Hendriks to score Calhoun and Trout. "I threw one quality strike," Soria said. "One quality pitch. They're going to make you pay if you don't throw quality pitches. I threw just five pitches and I gave them four runs." Kendrys Morales walked and singled in four plate appearances in his first game with the A's since being acquired from Toronto on Wednesday. Morales gives Oakland manager Bob Melvin much-needed flexibility with his lineup after losing Gold Glove first baseman Matt Olson for at least a month due to a hand injury. Melvin was presented with his manager of the year award during a pregame ceremony. Third baseman Matt Chapman and Olson received their Gold Gloves, while Davis was given a trophy for being the majors' top designated hitter. Angels: OF Justin Upton will miss eight to 12 weeks after being diagnosed with turf toe in his left foot. Upton was injured after running into the outfield wall chasing a flyball Sunday during an exhibition game. The Angels placed Upton on the injured list Thursday with hopes of a quick return. "It's certainly not ideal," Ausmus said.